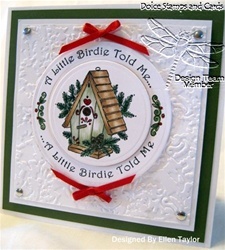 This is a quick simple card to make! This image reminded me of Christmas and how I always scramble in December to make a birthday card for my friend. I colored the image by scribbling on an acrylic block and picking up the ink with a blender Pen. I do this when I don't have all the colors in ink pads I want to use. I added Stardust stickles to the pine cones and some Xmas Red Stickles to the heart on the birdhouse and the berries. Popped the main image up with some EK 3D Dots and kept this card very simple. Only embossing One layer with the Sizzex Damask Embossing Folder and adding some Nail Heads in the corners and 2 small red bows. It feels good to get ahead of the December cards!